Leaders Lab / Building Teams / Top tips on how to avoid Groupthink! 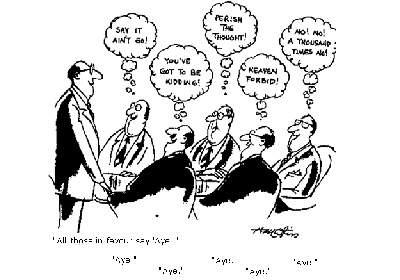 Groupthink can lead to bad judgments and decisions being made. It can also cause a group of decision-makers to rationalise a poor decision after the fact. It’s a simple and totally inadequate way to deal with difficult issues. Notice when Groupthink is happening and point it out to the group – its causes and, especially, its consequences. If you’re going against the group it helps to make this explicit by saying something like, “this may annoy some of you but…/I know this is going against the way we are thinking at the moment but..”. You are much more likely to be heard sympathetically rather than ganged up on by the group trying to maintain its path. Ahead of time, appoint one of the group members to play “devil’s advocate” and to challenge the group, looking for flaws in logic, false inferences and overlooked information. Test your thinking. Get out of your cocoon and ask questions of those who will be impacted by the group’s decisions. Pick up the phone, call a customer, or walk around and get a reality check! Encouraging feedback on what worked and what didn’t about previous decisions will also help keep your feet on the ground. Ask group members to get feedback from their own constituents before a final decision is made. Create one or more independent decision-making groups with different leaders to work on the same critical issue or policy. Then bring the sub-groups together to hammer out differences of data, assumptions and solutions. Get the group to make a formal presentation (including their data, assumptions and conclusions) to its leader (and possibly to his/her manager too). Have the group evaluate the decision-making process as part of the presentation. The leader should avoid stating preferences and expectations at the outset. Doing so creates pressure for others to agree. As a leader, encourage dissent and alternative comments. Remind everyone that open and frank communication is essential to good decision making and a healthy culture. If the decision is particularly important – or you think your decision-making process needs a fresh pair of eyes – ask a facilitator a) to be a fly on the wall and give feedback to the group or b) to lead the group through the process. What’s your experience of groupthink? What have been its consequences in your working life?